Luca runs a mill and is married to Carmela, a beautiful wife. But his wife's beauty catches the eye of Don Teofilo the Governor. Agnese has many men who woo her and live with her cousin Cesira Franca Valeri, who has the opposite problem with men and wishes she would also have men woo her. The relationships between a veteran marshal, his bride-to-be, a rookie and his fiancée are severely tested when the young carabiniere is temporarily sent to a distant town. This very earthy comedy was based on the play "The Three-Cornered Hat" from the Spanish novel of Alarcon. It is a subject which director Mario Camerini had previously filmed in 1935. This CinemaScope/Technicolor remake was a modest success in the States after its release, although not so big a hit with the Catholic Legion of Decency which condemned it. 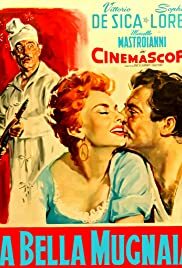 The film has Vittorio De Sica as a lecherous governor of Naples in 1680 who lusts after the wives of several peasants, particularly the miller's wife Carmela, played by a ravishing Sophia Loren. The miller himself, played by a youngish Marcello Mastroianni, plans to avenge his honor by seducing the wife of the governor. Wonderful fun boasting a great cast and one of the earliest pairings of Loren and Mastroianni.